Expedition is the first-ever joint ocean research voyage by the Republic of Indonesian and the United States. To experience it yourself, watch a Google Earth YouTube video tour here or explore the area more interactively with the Google Earth plug-in on our Ocean Showcase. The colored surface areas seen in the video represent underwater terrain data collected during the expedition. 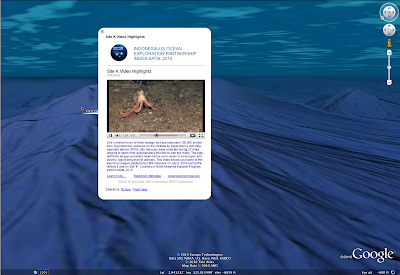 The data, highlight photos and videos have been incorporated into Google Earth so you can now explore them on your own by diving under the surface. Much of the Coral Triangle remains unexplored, and this partnership aims to help reverse the decline of coral reefs in the area and to protect natural resources. The expedition began in the SATAL region around two island chains stretching north of Sulawesi. It was undertaken by scientists from the USA National Oceanic and Atmospheric Administration, Indonesia’s Ministry of Marine Affairs and Fisheries, and the Indonesian Agency for the Assessment and Application of Technology. “Telepresence” was used to send data in real time to scientists who stood watch at Exploration Command Centers in Jakarta and Seattle. This same technology brought the excitement of the expedition to visitors at the Exploratorium in San Francisco as well. Mapping and discovery data from expeditions like this will help all organizations involved better understand ocean resources and how to protect them. More information about the still mysterious ocean will ultimately further economic and environmental initiatives such as the management of sustainable fisheries, the conservation of the marine environment and the preservation of fragile corals. Come on a tour to never-before explored Indonesian waters. The INDEX-SATAL 2010 Expedition is the first-ever joint ocean research voyage by the Republic of Indonesian and the United States. 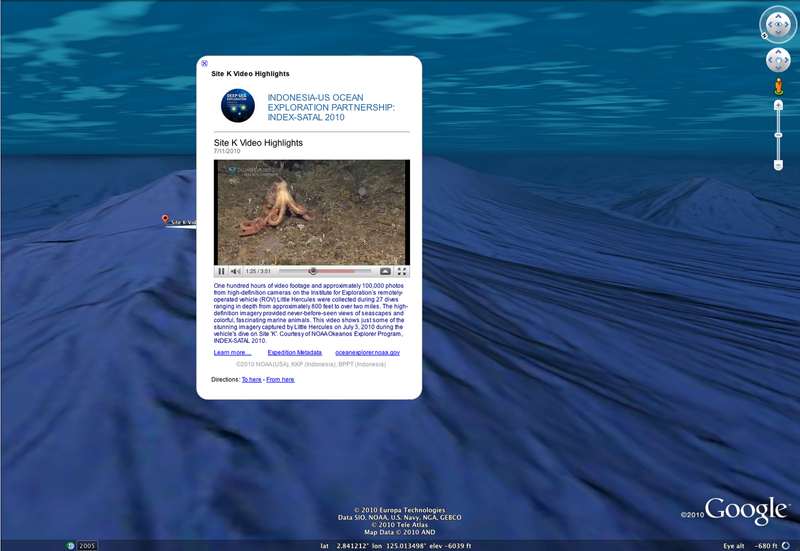 To experience it yourself, watch a Google Earth YouTube video tour here or explore the area more interactively with the Google Earth plug-in on our Ocean Showcase.